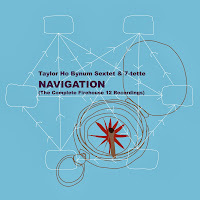 The advantage of driving over motorways to Germany and back in a span of around six hours, and this on two consecutive days, offered the unique opportunity to listen almost in one stretch, and then again, to Taylor Ho Bynum's long and ambitious "Navigation". It is kind of a strange release, with the live sextet playing "Possibility Abstracts X & XI" appearing on a double vinyl LP, and the studio performance of the septet playing "Possibility Abstracts XII & XIII" on a double CD, with luckily all material also being available as downloads. So much for the release complexity. 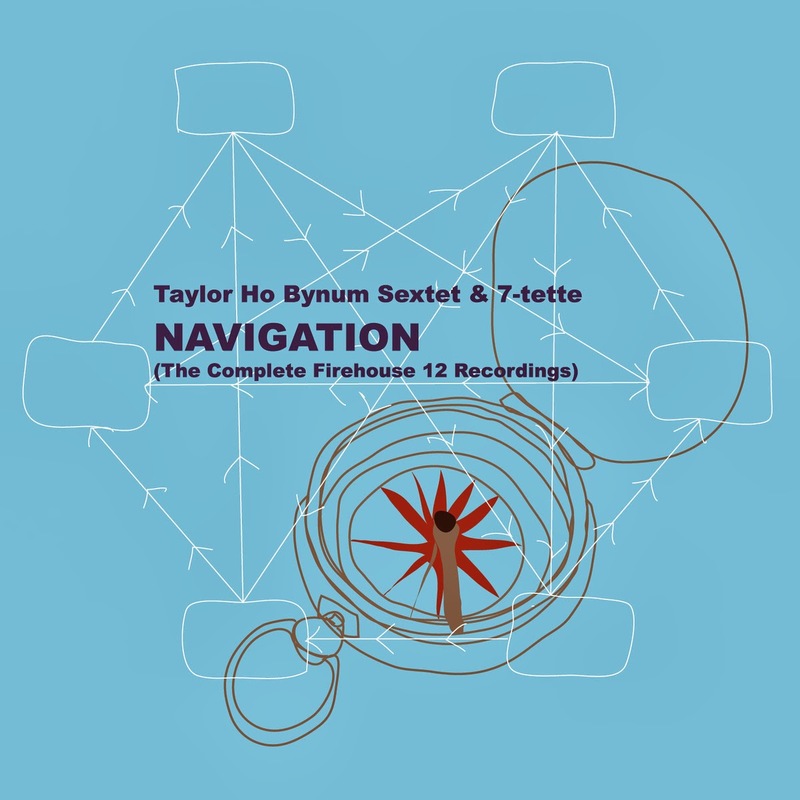 The sextet is Taylor Ho Bynum on cornet, Jim Hobbs on alto, Bill Lowe on bass trombone and tuba, Mary Halvorson on electric guitar, Ken Filiano on acoustic bass and Tomas Fujiwara on drums and vibes. The septet is the same band with Chad Taylor joining on drums and vibes. In sum, the band we've heard before on "Apparent Distance" and "Asphalt Flowers, Forking Paths". The four long tracks, each a little over fourty minutes, are performances of one single composition for improvisers, built around six movements, that are easy to identify, and around which the band improvises. However, there is no need to play the movements in a particular order, and the initiative and creativity of the musicians enter into play to make it all happen on the spot. It's a little like navigating to six different places, including the use of cartographic notation, as symbolised by the artwork, but without clear sailing plan on how to get there. By itself I have some doubts about the value of this, because it does not offer a better listening experience per se. It says nothing about the music, nor about the quality of the playing. Yet I have to give Bynum the credits he deserves for this, because the listening experience is a good one, especially if you have time and if you can compare the various versions. The composition and improvisation offer a lot, and vary from uptempo almost fusion-infused parts over more jazzy themes to controlled and intense pieces of common improvisation, often ominous and foreboding. It is only after several listens that you start realising the differences between the various performances, with Mary Halvorson on "Abstract XI" giving the kind of electric guitar soloing that I've rarely have heard play before, including some heavy chords during the "fusion" theme. "Abstract XII" has a longer calmer part in the mid-section, but then the rhythm kicks in again, with Filiano's bass grounding the piece in its central theme, yet less explicit than in other variations, and engaging Halvorson in a nice duet on arco. "Abstract XIII" has become even more abstract, with the main themes now identifiable, yet even less explicit, and strangely enough making the solo performances and some of the horn sections more sensitive and fragile, even bluesy near the end. And that's the nice thing about Bynum's compositions, they are jazz with all the elements of tradition, with blues, swing, bop, funk, fusion - luckily all rather implicitly, yet obviously present - up to Braxton and today's avant-garde mixed into one great suite, full of variation and fantastic interplay, and strange interactions. The entire band plays very strongly, with the obvious more visible performances of Taylor Ho Bynum and Jim Hobbs, and truth be said, they are magnificent. It is for the reviewer hard to make a judgment about which of the releases is best, as the material, the musicians are the same but the performances differ. Each performance is a joy to hear. When can I drive back to Germany?